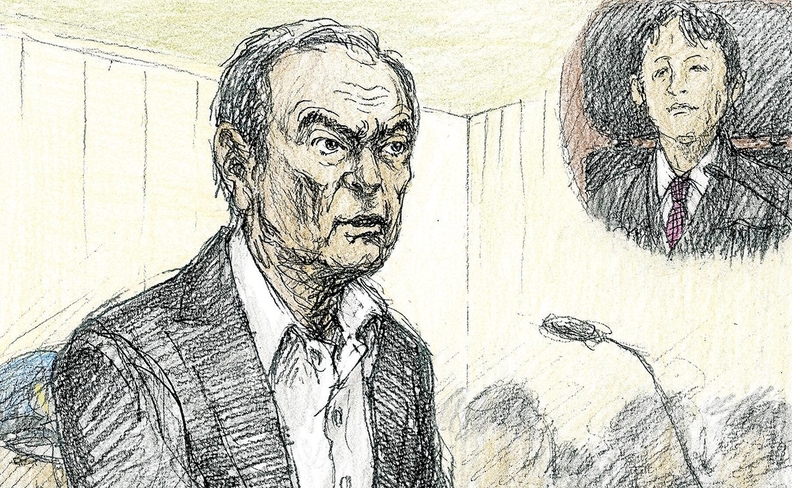 A courtroom sketch highlights Carlos Ghosn’s hollowed-out cheeks and tousled hair. TOKYO — Carlos Ghosn may have thought his greatest feat was saving Nissan from impending bankruptcy in 1999. But the embattled executive is now channeling the same steely resolve he exhibited then into an equally uncanny rescue bid: saving himself from prison. To hear Ghosn's lead lawyer tell it, the ousted Nissan chairman — even after two months in a Tokyo jail cell — is calm, cool and laser-focused on the task of proving his innocence in court. Ghosn has been confined to relative isolation since his shocking Nov. 19 airport arrest in Japan. But that changed last week when Ghosn, now gaunt and graying from weeks in detention, made his first public appearance in a Tokyo courthouse and outlined a point-by-point defense. To prepare for that brief 10 minutes before the judges, the ever-efficient Ghosn didn't make a fuss, lead lawyer Motonari Otsuru says. Ghosn's meetings with lawyers never lasted more than two and a half hours, even though his prosecutors have almost unlimited opportunity to interrogate him at will. "He wants to use this time as effectively as possible," Otsuru said at a mobbed news conference after last week's court hearing. Ghosn was permitted to read a statement in the courtroom and to hear an explanation for his detention. "He is very much focused on the content of the legal investigation, what kind of questions are being asked or what advice we have for him. He's very calm and logical," Otsuru said. Any complaints that Ghosn might have about the size of his cell or the comfort of his bedding are relegated to the diplomatic staff visiting him from the embassies of France, Lebanon and Brazil. Ghosn, 64, holds citizenship from all three countries, and their lobbying seems to help. Ghosn initially was locked in a cramped tatami mat room with a Japanese-style futon mattress on the floor. But he has been moved to a larger room with a western bed, Otsuru said. Otsuru conceded his client might need to get used to the lodgings. Ghosn was hit with indictments on two more charges Friday, Jan. 11, and it was unclear at press time whether he would be granted bail. The lawyer said winning bail was unlikely and said Ghosn's case might not go to trial for another six months. Ghosn arrived in court handcuffed, led into the hearing wearing a dark suit with no tie and green plastic slippers. Courtroom sketches of the moment made sure to highlight his hollowed-out cheeks from two months of meager rations, and the tousled strands of his usually immaculately groomed raven-black hair. Inside the courtroom, Ghosn and his lawyers ticked off a multipoint defense against the charges that have upended the career of one of the auto industry's most storied executives and cast doubt over the future of the Renault-Nissan-Mitsubishi auto empire that he founded two decades ago. "I have been wrongly accused and unfairly detained based on meritless and unsubstantiated accusations," Ghosn told the court in a calm, controlled voice. "I have always acted with integrity and have never been accused of any wrongdoing in my several-decade professional career." The landmark day was also notable for a few new wrinkles in the case. Ghosn's lawyers dismissed a narrative that has gained some currency in recent weeks, that the executive is the victim of a corporate coup led by CEO Hiroto Saikawa in a power struggle with top shareholder Renault. Motonari Otsuru, Ghosn’s lead lawyer, said his client feels “dissatisfaction” toward some of his former Nissan colleagues. He also contradicted an assertion by Anthony Ghosn, Ghosn's son, to France's Journal du Dimanche that Ghosn was being pressured to sign a confession printed in Japanese that he didn't understand. "Not once has Mr. Ghosn expressed to us any concerns about being asked to sign a prosecutor's statement in Japanese over concerns about the accuracy of translation," said Otsuru, a former lead prosecutor at the division that is spearheading the investigation against his client. Meanwhile, if Ghosn were as wealth-obsessed as prosecutors portray him, he might have never ended up in a Japanese jail cell. In his statement to the court, Ghosn recounted how "four major companies" tried to recruit him away from Nissan, including Ford and General Motors. Despite the lure of bigger money, he said he felt a duty to finish his revival work at Nissan. "Even though their proposals were very attractive, I could not in good conscience abandon Nissan while we were in the midst of our turnaround," Ghosn said in his prepared remarks. "Nissan is an iconic Japanese company that I care about deeply." But after Ghosn stayed with Nissan for nearly two decades, an internal investigation at the company uncovered what Saikawa, Ghosn's longtime No. 2, called "significant acts of misconduct." Ghosn was indicted Dec. 10 for allegedly falsifying securities filings by not reporting 4.9 billion yen ($45.1 million) in deferred compensation in the 2010-14 fiscal years. Since then, he was slapped with two other indictments Friday. The first is similar to the original — for allegedly underreporting compensation, again to the tune of tens of millions of dollars, but over the 2015-17 fiscal years. The second indictment was on separate allegations of temporarily shifting $17.1 million in personal swap contract losses to Nissan, and having Nissan pay $14.7 million to a business associate who allegedly helped Ghosn handle the red ink. If convicted on all three charges, Ghosn could face up to 15 years in prison, prosecutors said. Otsuru conceded Ghosn feels "dissatisfaction" toward some former Nissan colleagues. But the defense strategy overlooks any bad blood and trains squarely on the legal issues. Even in the Japanese media, many lawyers are calling Ghosn's counterarguments persuasive. "It is not at all about winning sympathy for leniency or a suspended sentence," said Nobuo Gohara, a former prosecutor now in private practice. "The prosecutors' allegations are all wrong in the first place. I think he is innocent, just as he said so himself in court." In his remarks, Ghosn denied wrongdoing in all charges against him. Regarding the first indictment about underreported compensation, he said the amount of deferred remuneration had not been fixed and none of it had been disbursed. Therefore, there was nothing to disclose and there was no intent to violate the law, he reasoned. "Contrary to the accusations made by the prosecutors, I never received any compensation from Nissan that was not disclosed, nor did I ever enter into any binding contract with Nissan to be paid a fixed amount that was not disclosed," he said. "The test is the 'death test': If I died today, could my heirs require Nissan to pay anything other than my retirement allowance? The answer is an unequivocal 'No.' "
Ghosn made a twin-pronged defense against the charges that he transferred personal losses to Nissan. He admitted to leveraging Nissan as collateral against his swap losses, but said that the loss-making swap contracts were transferred back to him at no cost to Nissan. Indeed, he said he signed an agreement with Nissan and his bank that Nissan would incur no monetary loss during the period the swap agreement was temporarily shifted to Nissan. Ghosn also said the payments made to his business associate — Saudi businessman Khaled Al Juffali — were for legitimate business purposes, not a kind of payback for clearing those losses. Ghosn said Juffali's company helped Nissan solicit financing and restructure struggling distributors in the Middle East. He also helped Nissan negotiate the development of a manufacturing plant in Saudi Arabia by organizing high-level meetings with Saudi officials. But Nissan suspects that the payments to Juffali were actually payback for Juffali's assistance in arranging a credit line that helped Ghosn handle his swap losses. Otsuru confirmed that Juffali did extend Ghosn $27.6 million in extra collateral to help him in 2009, but he said it was unrelated to the later payments. Nissan alleges that Ghosn used what's known as a CEO reserve fund, normally used for unbudgeted, one-time expenditures, to pay a company owned by Juffali in four installments totaling $14.7 million over the 2009-12 fiscal years. 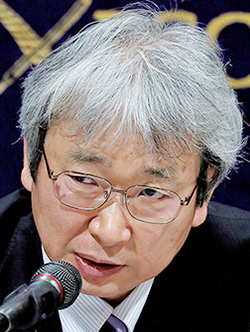 Otsuru attacked prosecutors for not interviewing Juffali before leveling charges. He submitted a statement from Juffali backing Ghosn's assertion the payments were legitimate. "The prosecutors seem to believe that the suspect made Nissan pay $14.7 million to a company that I manage in order to thank me for cooperating in issuing a standby letter of credit for the suspect," the statement reads. "That is completely unfounded." Throughout his court appearance, Ghosn emphasized his devotion to Nissan and his achievement in transforming it from a near-bankrupt national embarrassment in 1999 into a "pillar of the Japanese economy" today. He cited figures to back up the revival. "We transformed Nissan, moving it from a position of a debt of 2 trillion yen ($18.4 billion) in 1999 to cash of 1.8 trillion yen ($16.6 billion) at the end of 2006, from 2.5 million cars sold in 1999 at a significant loss to 5.8 million cars sold profitably in 2016," Ghosn said. "These accomplishments, secured alongside the peerless team of Nissan employees worldwide," Ghosn said, "are the greatest joy of my life, next to my family." Nissan said it could not comment on the judicial procedures, but issued a statement saying that its internal investigation "uncovered substantial and convincing evidence of misconduct, resulting in a unanimous board vote to dismiss Ghosn as representative director. "The company's investigation is ongoing," it added, "and its scope continues to broaden."